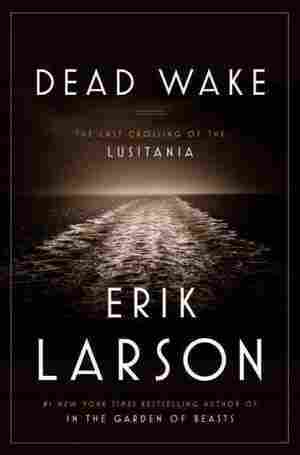 Dead Wake NPR coverage of Dead Wake: The Last Crossing of the Lusitania by Erik Larson. News, author interviews, critics' picks and more. Erik Larson presents a 100th-anniversary chronicle of the sinking of the Lusitania that discusses the factors that led to the tragedy and the contributions of President Wilson, bookseller Charles Lauriat and architect Theodate Pope Riddle. March 10, 2015  Erik Larson's new book about the sinking of the liner Lusitania by a German U-boat in 1915 brings the past stingingly alive. Reviewer Jean Zimmerman calls Dead Wake "thrilling, dramatic and powerful." March 7, 2015  The ocean liner's sinking by a German U-boat led to the U.S. entering World War I. Erik Larson, author of Dead Wake, says British intelligence knew the ship was in danger and didn't tell anyone. March 5, 2015  The Devil in the White City author Erik Larson turns his attention to the sinking of the liner Lusitania almost 100 years ago — a turning point that helped bring the United States into World War I. On the night of May 6, 1915, as his ship ap­proached the coast of Ireland, Capt. William Thomas Turner left the bridge and made his way to the first-class lounge, where passengers were taking part in a concert and tal­ent show, a customary feature of Cunard crossings. The room was large and warm, paneled in mahogany and carpeted in green and yellow, with two fourteen-foot-tall fireplaces in the front and rear walls. Ordinarily Turner avoided events of this kind aboard ship, because he disliked the social obligations of captaincy, but tonight was no ordinary night, and he had news to convey. There was already a good deal of tension in the room, despite the singing and piano playing and clumsy magic tricks, and this became more pronounced when Turner stepped forward at inter­mission. His presence had the perverse effect of affirming every­thing the passengers had been fearing since their departure from New York, in the way that a priest's arrival tends to undermine the cheery smile of a nurse. It was Turner's intention, however, to provide reassurance. His looks helped. With the physique of a bank safe, he was the embodiment of quiet strength. He had blue eyes and a kind and gentle smile, and his graying hair—he was fifty-eight years old—conveyed wisdom and experience, as did the mere fact of his being a Cunard captain. In accord with Cunard's practice of rotating captains from ship to ship, this was his third stint as the Lusita­nia's master, his first in wartime. Turner now told his audience that the next day, Friday, May 7, the ship would enter waters off the southern coast of Ireland that were part of a "zone of war" designated by Germany. This in itself was anything but news. On the morning of the ship's departure from New York, a notice had appeared on the shipping pages of New York's newspapers. Placed by the German Embassy in Wash­ington, it reminded readers of the existence of the war zone and cautioned that "vessels flying the flag of Great Britain, or of any of her allies, are liable to destruction" and that travelers sailing on such ships "do so at their own risk." Though the warning did not name a particular vessel, it was widely interpreted as being aimed at Turner's ship, the Lusitania, and indeed in at least one promi­nent newspaper, the New York World, it was positioned adjacent to Cunard's own advertisement for the ship. Ever since, about all the passengers had been doing was "thinking, dreaming, sleeping, and eating submarines," according to Oliver Bernard, a theater-set designer traveling in first class. Turner now revealed to the audience that earlier in the evening the ship had received a warning by wireless of fresh submarine activity off the Irish coast. He assured the audience there was no need for alarm. Coming from another man, this might have sounded like a baseless palliative, but Turner believed it. He was skeptical of the threat posed by German submarines, especially when it came to his ship, one of the great transatlantic "greyhounds," so named for the speeds they could achieve. His superiors at Cunard shared his skepticism. The company's New York manager issued an official response to the German warning. "The truth is that the Lusitania is the safest boat on the sea. She is too fast for any submarine. No German war vessel can get her or near her." Turner's personal ex­perience affirmed this: on two previous occasions, while captain of a different ship, he had encountered what he believed were sub­marines and had successfully eluded them by ordering full speed ahead. He said nothing about these incidents to his audience. Now he offered a different sort of reassurance: upon entering the war zone the next day, the ship would be securely in the care of the Royal Navy. He bade the audience good night and returned to the bridge. The talent show continued. A few passengers slept fully clothed in the dining room, for fear of being trapped below decks in their cabins if an attack were to occur. One especially anxious traveler, a Greek carpet merchant, put on a life jacket and climbed into a lifeboat to spend the night. Another passenger, a New York busi­nessman named Isaac Lehmann, took a certain comfort from the revolver that he carried with him always and that would, all too soon, bring him a measure of fame, and infamy. With all but a few lights extinguished and all shades pulled and curtains drawn, the great liner slid forward through the sea, at times in fog, at times under a lacework of stars. But even in darkness, in moonlight and mist, the ship stood out. At one o'clock in the morning, Friday, May 7, the officers of a New York–bound vessel spotted the Lusitania and recognized it immediately as it passed some two miles off. "You could see the shape of the four funnels," said the captain, Thomas M. Taylor; "she was the only ship with four funnels." Unmistakable and invulnerable, a floating village in steel, the Lusitania glided by in the night as a giant black shadow cast upon the sea. Reprinted from Dead Wake: The Last Crossing of the Lusitania. Copyright 2015 by Erik Larson. To be published by Crown Publishers, an imprint of Penguin Random House LLC, on March 10.